I started of the month with Harry Parker’s Tours visiting the Newark area . This was an educational and very enjoyable trip visiting farms doing different things. Thanks to Harry for organising a great trip and also to all the host farms for their time and hospitality. On return I was straight on the combine cutting winter barley – Results and yield vary with the light sand suffering in the dry weather and the heavier ground surprisingly yielded better than anticipated. It was straight on to winter oats afterwards, yields were 20% down. In the last week of the month we finished the winter wheat which overall turned out better than expected under the conditions. Two months hot dry summer weather meant the harvest work was completed nearly a month earlier than usual. 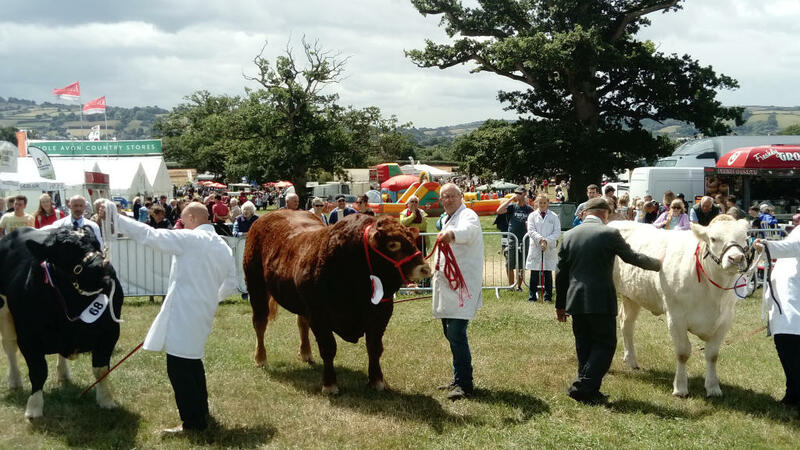 I had the pleasure of judging Launceston Show – congratulations to Jo and Tony Smith for winning it overall. I took a couple of bulls to Mid Devon Show and did not disgrace ourselves winning a class. Grass has become a very scarce commodity – turning brown from green – and we have started feeding winter supplies to keep cows and calves happy. We are very lucky to have leftovers in reserve from previous years. The cattle seem content at the moment with shade and water but have caused issues. Stubble turnips have been sown so let’s hope it rains shortly to get them to germinate.